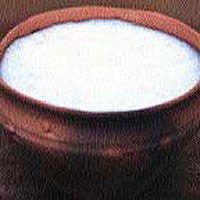 Lassis are drunk throughout India, though the sweet, salty ones like this are more popular in the northern states of Bihar and Uttar Pradesh. This cool and refreshing drink is delicious flavoured with ground cardamom, although you can serve it without. Put the yogurt, water, salt and sugar in a large jug and stir together until smooth. Crush the cardamom pods (if using) in a pestle and mortar and add to the mixture, saving a little for the garnish. Add more yogurt or water if you prefer it thicker or thinner. Pour into a glass, sprinkle with the reserved cardamom, if using, and serve.